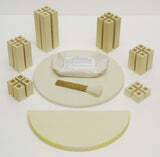 The Evenheat High Fire 1413 ceramic kiln is designed specifically for the home ceramic artist. With interior dimensions of 14.5" diameter x 13.5" deep for a 1.3 cubic foot volume, the size is perfect for smaller-size work. The HF 1413 is constructed of American-made 3" firebrick throughout to allow for cone 10 work with greater efficiency and temperature distribution. Choose from a selection of controllers for the most accurate and consistent firings. The High Fire 1413 ceramic kiln comes with a free 2 year warranty.